This iconic city, associated with movie stars, shopping, beaches and nightlife brings everything to your visit within a very small circumference. It’s an easy drive or public transportation to Hollywood as it is to Sunset Boulevard, Venice Beach or Disneyland. There’s something for the whole family in Los Angeles, day or night, any time of the year. Because Los Angeles is a prime destination all year long, there really isn’t a “best time” to vacation here for prices. There is some give on hotel prices between September and May during what is called the “shoulder season”. Magic Savings Tip: The earlier you plan and book your stay, the better chance you have of getting a lower room rate. Your hotel can also be of assistance in getting discounts at area attractions. You need to visit Hollywood Blvd and the Hollywood Walk of Fame, with its 2,500 stars embedded in the sidewalk where you can try and find your favorite movie star from present or past. Remember you’re in Los Angeles in the back yard of some of the most famous stars of today, so keep your eyes open and camera at the ready. You never know when that guy walking towards you looking like Leonardo DiCaprio could suddenly become a reality. Visit Universal Studios theme park for a total day of excitement and fun for the whole family. Helpful hint: If you are there during summer or holidays, it is advised to purchase a “front of the line pass” so you can walk past the 100’s waiting in line. It may cost a bit, but if you can afford it, it’s well worth the price. Everyone dream especially for the little guys and a girl is a day or two at Disneyland. Plan to get there when gates open to beet the crowds to your favorite exhibits. Another great way to spend a day is visiting the Los Angeles Zoo and Botanical Gardens. Something every visitor should do is take a double decker bus tour of the Hollywood mansions. You just never know whom you might see out walking the dogs, or washing the Lamborghini. For an upscale modern restaurant, and one of the top three choices for restaurant and wine of the year 2013 by Wine Enthusiasts, try Hatfield’s on Melrose Ave. An experience in fine dining and wine, make reservations and bring an open credit card. For great Italian cuisine and entertainment, Miceli’s on Las Palmas Ave is excellent for the whole family. It’s the oldest Italian restaurant in LA, and the waiters sing to you while you dine. Take a driver and spend the day at the Santa Monica Pier. Ride the historic wooden roller coaster if you dare. Enjoy a fun day of shopping, amusements, history, the Aquarium, or maybe take a trapeze course at the pier Trapeze School. Within two hours from your hotel in Los Angeles you can be on southern California Beaches, the desert, and more. A fun trip is down to Long Beach an hour south and catches the Catalina Express out to Catalina Island, the Aquarium of the Pacific or the Queen Mary for a tour. You’ll find the Island of Catalina a relaxing place to dine, sip some wine, rent bicycles or even scuba dive. The style of vacation you want will determine in which area of Los Angeles you want to stay in. Travelers on the search for a sun tan will want to be as close to LA's beach city, Santa Monica, as possible. The Ambrose Hotel and the Fairmont Miramar Hotel are the best places to stay as they put you literally steps away from the ocean. Both provide luxury accommodation mixed with a laid-back attitude, which is prevalent trait across much of LA. If you're keen on exploring nature rather than the city, then Venice Beach Eco Cottages are a wonderful accommodation choice. Visitors to LA's seaside paradises, which are spread up and down the Pacific Coast, can escape from the city-center and still be within 30 minutes of downtown. Unique shopping, pier amusement parks and boating can all be found along the coast. If you want to be closer to the action, stay downtown at the Westin Bonaventure, one of LA's most iconic hotels. This huge hotel towers over the neighboring buildings and can be seen from miles away. From here you can explore Silver Lake's charming eateries and shops. The locals love spring in LA. What passes for winter in southern California has long since departed and they start breaking out the sunscreen and tall glasses filled with something cold. You're in LA, so do a very LA thing during spring break and visit the beach. There's a beautiful waterfront area at Long Beach with some attractions to keep you and the kids amused. The older children in particular will love the incredible Aquarium of the Pacific and if you're lucky the current exhibit - the Penguin Habitat - will still be on display. Head to the rather quaint Shoreline Village for a tasty and not-bad-for-the-budget bite at the Pizza place there, or if the wallet can handle something a bit more upmarket, head over to Parkers' Lighthouse for gorgeous views and excellent food. If you're hot and thirsty after all that sightseeing, check out Shenanigans Irish Pub & Grille for great food and drinks. Don't forget, Long Beach is also home to the impressive Queen Mary. 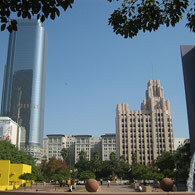 Downtown LA rarely rates a mention in the things to do blogs but it's worth the effort. 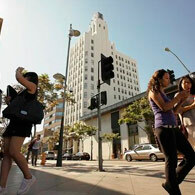 This where the Fashion District resides and where L.A. Live hangs its hat. Downtown is where you'll find some seriously good restaurants plus some of the best shopping in the city. Did we say shopping? The L.A. Fashion District spans 100 blocks and has everything from independent retailers to amazing bargain shopping at Santee Alley. Visit the Grammy Museum at L.A. Live, and then head upwards to the Perch Rooftop Bistro for Oyster's and Jazz and breathtaking views of Los Angeles. Make sure you get a cheap hotel in Los Angeles because there's such a lot to do in this city that you'll not spend a great deal of time in it! There's much to love about a visit to Los Angeles as the weather starts to turn in, but even sunny LA can get cool during the winter months. Our suggestion is to head to Santa Monica - not only do you get the beach during the daylight hours but you get great shopping should the weather go bad. It's a great place to spend a few days, and you'll find a great place to stay in any of the hotspots of LA. While you're here, you have to visit the Pier - the Santa Monica Pier has a kiddies Carousel, a solar-powered Ferris Wheel, a small roller coaster and a couple of other rides just perfect for young ones. Older kids might like the Santa Monica Pier Aquarium, the Trapeze School, and while they're doing that you can indulge in the food vendors and some gift shops. The Third Street Promenade is lined with all manner of shops and ever-so-healthy restaurants (those Californians!) and usually has a few street performers plying their trade. If you want good quality food at decent prices, head in to the food court at 1315 Third Street Promenade and try a Wolfgang Puck Pizza. If you're feeling more adventurous walk south along the promenade until you hit Venice Beach. It's not that far but it could be a hundred miles away given the difference in the communities. Venice is the rough and tumble slacker younger brother of all growed up Swiss finishing school Santa Monica, but it has undeniable charm, especially along the boardwalk. You don't have to button down for winter just yet! If home for you is a slightly cooler version of LA cool, then head for the beaches in Los Angeles this Fall. There's plenty of excellent accommodation to be had on our site and you can really live it up on the savings. Better yet, there are plenty of hotels close to all of the famous beaches. Try your luck at Santa Monica. Not only is the beach absolutely gorgeous, but the chic shopping in and around Santa Monica is second to none. All the major department stores and a ton of uber cool boutiques are within a block or two of one of California's best beaches. Close by is LA's best beach for people watching - of every variety and disposition. Venice Beach is everything you thought it was and more. This is where you'll find the muscle gym, the home base of Jim Morrison and exercisers galore - walking, running, roller-blading and in fact anything that resembles exercise. Here's where you'll also find America's most exotic buskers - from chainsaw jugglers to palm readers. Up the coast lies Malibu, fabled beach home to the stars and backdrop to countless movies. It's quite the surf beach, so if you've a yen to try your hand at surfing, here's where to do it. Surfrider Beach is the stretch you're looking for and you can lounge on the sand just watching or jump right in. Closer to the city is Hermosa Beach with its hipster vibe and a very cool, urban feel to the folk and surrounding restaurants and stores. It's quite the scene and there's a distinct smell of money in the air down here. Pier Plaza is the number one hang out spot, but I'm sure you'd rather just enjoy the beach. 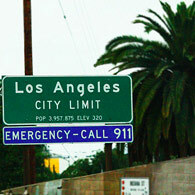 Most of us don't think of LA as a 'child' city - but it truly is, and not just because of the large theme parks either. What to do with the kids in LA? Here are a few answers! Check Cheaprooms.com first of all and find a room in Los Angeles so that you can spend less on hotels, and more on your vacation. There are more than 600 hotels in the Los Angeles area and the prices for even very good properties are great value for money. 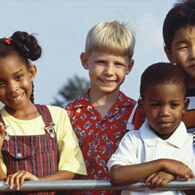 Find cheap accommodation in Los Angeles and have a great time with the kids, cheaprooms style! The key to having a great time with the children while on vacation lies in activities that they love and that you can tolerate - or even love too! Spend a day at Santa Monica and take the kids to the Santa Monica Pier Aquarium and let them see all the critters of the bay area up close. From anemones to starfish and exotics, the Pier Aquarium has them all in a fun place located beach-level, just below the Carousel. You'll enjoy it, plus all the activities in and around the Pier. A day at the beach is really something if you're not used to seeing one. And LA beaches are something else again. Venice Beach in particular is where you will see every wild and wacky 'so LA' thing you've ever dreamed of. Let the kids play on the beach and then walk the boardwalk, watching the street performers, grab an ice cream cone and just indulge in endless people-watching. Over in Pasadena is the Kidspace Museum which is an excellent space for the kids to burn off some energy. There are things to climb and jump off, interactive displays as well as exhibits like the miniature Arroya Seco to explore and learn from. If you have children of ten and over, consider taking them to the taping of one of the many children's TV programs that are filmed in LA. The ones that actively request attendees are the Nickelodeon and Disney companies. The best way to get tickets is to order in advance through vendors such as Audiences Unlimited or Hollywood Tickets. LA LA, what to eat! We rush all over the place to these marvellous new cities and explore them day in and day out and then have the trip marred by terrible food - simply because, as a stranger to town, you get roped in to a restaurant no local would bother with! 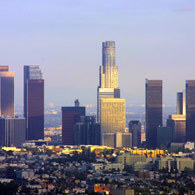 Go to Cheaprooms.com and find a great Los Angeles hotel room to enjoy the sights - and the eats - in LA. Food in LA is no longer the province of fast food gastronomy (as New Yorkers would have you believe), it truly is a renowned foodie paradise with some of the best chefs and restaurants in the world. 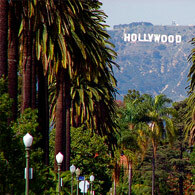 Find cheap accommodation in Los Angeles now and make the most of every aspect of your trip. If you're up and at 'em early, make your first stop the Brentwood Country Mart on 26th Street in Brentwood. Not only is there an exceptionally lovely little collection of boutiques from around the world to whet your fashion and nic-nacs appetite, but there are plenty of food destinations to choose from. Try the Farmshop and Sweet Rose Creamery for something special. Make dinner one night of your trip an extra-special event. Our recommendation is Providence at 5955 Melrose Avenue. Not cheap (of course! ), but an award-winning restaurant with an exuberant chef producing such wonders as Maine Lobster, fresh Alaskan Crab and what they term 'the ugly bunch', abalone, geoduck and sea urchin. The emphasis is on seafood although they do do a steak, and dinner carries a fixed price of $85. Lunch needn't be a quick sandwich, maybe a not-so-fast burger might suffice? Try the burgers at Umami (3 locations). The classic is just plain delightful, although there's nothing old-fashioned about shiitake mushroom, caramelized onions, roasted tomato, parmesan crisp and umami ketchup. Burgers never tasted so good. Forget Cyber Monday... forget trawling the web for auction bargains... get some real fun into your life with an honest-to-goodness shopping run to LA with your girlfriends! It's big, bold and full of beautiful things to buy! Check Cheaprooms.com for quality hotels to choose from in Los Angeles. The discount rooms in Los Angeles offer so much, for so little money. Get ready for a bargain in more ways than one. The big tip is to combine location and activities - so somewhere around the Hollywood area will do nicely. You'll find a good deal on Cheap Rooms with plenty of extras and options. There's something about Hollywood that says LA, with lots of color, movie stars, people-watching and shopping - in the Hollywood & Hyland Center. It's a massive shopping and entertainment complex with more than five floors of temptation - including major brands like Louis Vuitton, Sephora, DFS Galleria and more. You saw it on TV, now get to Melrose Place for real. This is the current hipster hangout for LA, so expect lots of coffee shops and ironic boutiques. That said, there's plenty of cool, sophisticated shopping here too. Bonus play - Paramount Studios are on Melrose (do some star spotting in between lattes). Famous the world over - shopping on Rodeo Drive is just an LA natural thing to do. Even if you don't have a no-limit Platinum card, the way-cool little boutiques may just have something fun and ready-to-go. Plenty of shops cater to 'normal' budgets, so don't be put off by the Pretty Woman reputation. The weather is always good here... so go the Grove. It's an outdoor shopping mecca near the farmers market, close to Melrose, so it's fairly convenient for most public transport. There's plenty of upmarket choices as well as a lot of artisan shops and some great restaurant and bar choices close by. Making the most out of the great outdoors in LA! When it comes to all the tempting things about LA, they're so blessed with good weather that much of it is outdoors. Before you arrive, get on to Cheaprooms.com and get yourself to Los Angeles with a cheap hotel packageto suit every budget and every size group. One of the big drawcards in LA is Venice Beach. It's quirky, crowded on weekends and home to the stars. If you want to stay close to Venice, check out the cheap accommodation in Los Angeles and get ready to enjoy a great part of town. Part of what makes Venice Beach so special is the fact that it's the artistic center of Los Angeles. The monthly Venice Art Crawl makes its way from pop up gallery to gallery-proper and shows off the newest artists and the seasoned veterans. There is so much happening at Griffith Park to the northeast of the city that it's hard to cover in a paragraph. Horse riding is one of the attractions here and the trails and wonderful scenery make for a pleasant afternoon out. Riders can enjoy many specially marked trails, fire, and patrol roads within the park boundaries. The other major attraction in the park is the Griffith Observatory - Los Angele's premier star-gazing venue in a delightful setting. Not just an observatory, the kids will actively learn all about the stars and the enthusiastic guides put on a great show. The original Farmers Market in LA is a great experience for anyone who loves great, natural produce and an abundance of the shops and products of yesteryear - from old fashioned barber shops to modern new-age restaurants. They're on the corner of Fairfax and 3rd in West Hollywood.